It was technically my third time in Paris, but only the second one I could remember. I had gone to EuroDisney when I was a child, so that memory of Paris was pretty much lost to time (and no doubt eclipsed by visuals of Mickey Mouse and photographs of an ice-cream-covered young me). But I visited once again a few years ago, and I still remember those strolls around Place Vendome, Marais, the Seine. 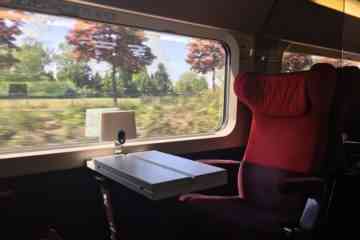 Note: My visit to Paris was provided courtesy of Rail Europe in collaboration with Mama Shelter Paris; however, all opinions and viewpoints expressed in this post are, as always, my own. This post does contain some affiliate links, for which I will earn a small commission (at no extra cost to you, of course). If you want to get to Paris for a four-day getaway with airfare, hotel and a Paris Pass included, book a trip with amazing rates at Great Value Vacations. Paris is one of those cities I enjoyed so much more the second time around. Not that I don’t love the Louvre, the Eiffel Tower, Place Vendome, Notre Dame and the Catacombs; but it’s nice to have already hit the tourist high points, and then just have the freedom to explore. The French have a word for this, my favorite activity of all time – flâner: roaming around without a destination. Finding alleys and dead-ends on my walks around Paris. I stayed in the 20th arrondissement, far removed from the tourist center. Here are the spots I meandered through, which I highly recommend if you want to wander around some local, (slightly) less tourist-centric parts of the city. 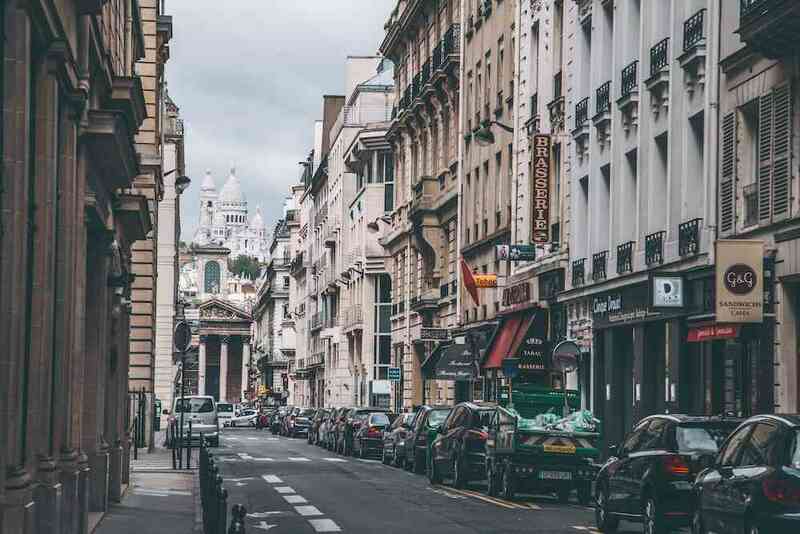 On either side of the island that’s home to Notre Dame are great neighborhoods to meander around – first and foremost, the Latin Quarter, on the south side. Located in the 5th and 6th arrondissements, it contains plenty of gorgeous, historic buildings from the 16th to the 18th century, as well narrow, sloping streets (just a heads up, your thighs will get quite a workout going up those hills). 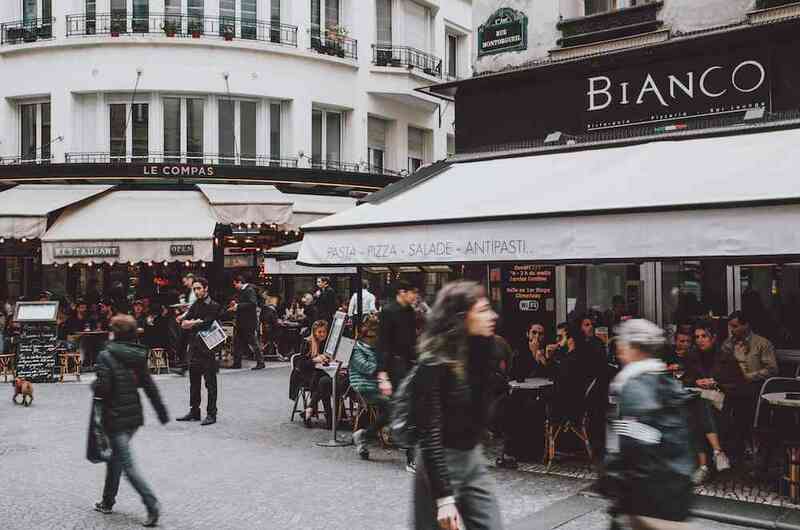 This is a popular student area, thanks to the nearby Sorbonne and several other campuses, so plenty of cafes, bookshops, and markets line the charming roads, along with some Roman influence and ruins. 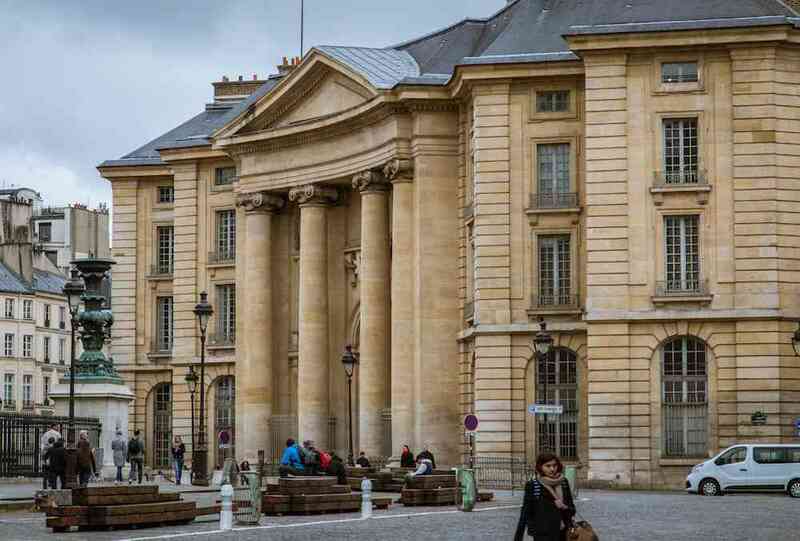 It also holds some great, less-visited Paris sights like the Pantheon (yep, there’s one in Paris too), and is also near the famous Jardin du Luxembourg. The Pantheon towering above the other Latin Quarter buildings. 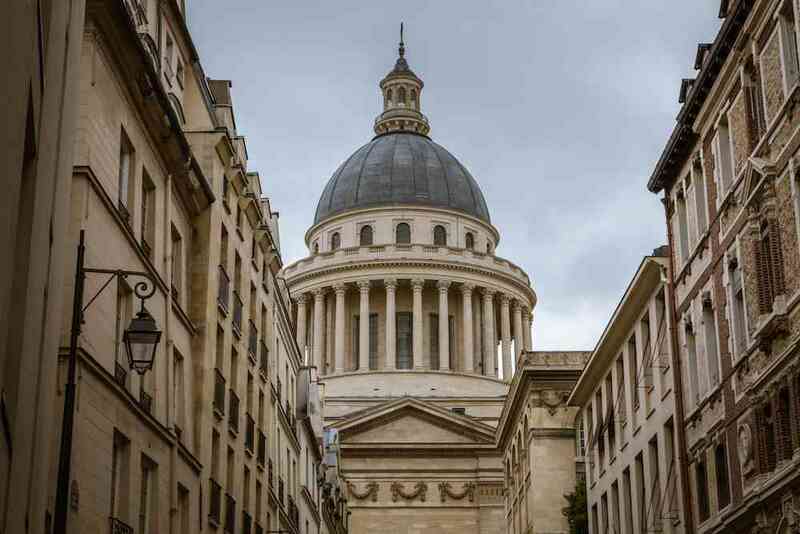 Pantheon – Built in the 1700s, the Pantheon has incredible architecture and is the resting place for Voltaire, Rousseau, and Emile Zola, among others. Arènes de Lutèce – Roman amphitheater ruins surrounded by gardens. Rue Mouffetard – The most scenic of the medieval, narrow, sloping streets in the area, with a street market operating most days. Eglise Saint-Etienne du Mont – A 15th-century church next to the Pantheon. Place de l’Odeon – A beautiful place to wander around, with a historic 1700s-era theater. It might be hard to believe if you love this city, but at one point, Parisians wanted a change from their distinctive Haussmannian architecture. So in the center of the 2nd arrondissement, the city council created a new street and asked architects to craft some innovative buildings – a prize would go to the best one. As a result, you can see everything from iron structures to Art Nouveau buildings here along Rue Réaumur. Check it out! 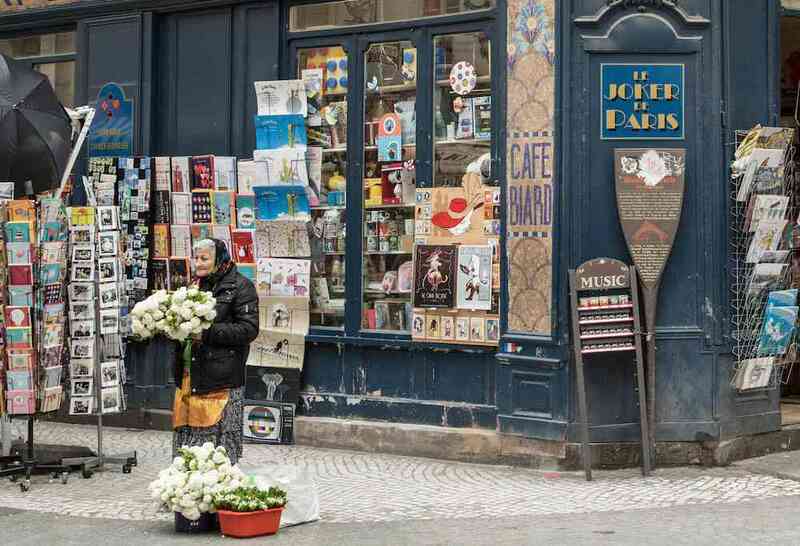 Walk around the hilly, hipster, artsy neighborhood of Montmartre if you haven’t been there before, but if you want to get some space from the huge tourist crowds after that, walk down towards the 9th Arrondissement and slowly make your way to the 2nd Arrondissement below. The 9th Arrondissement is known as “Nouvelle-Athènes”, thanks to the Hellenic influence on the townhouses and mansions in the area. This area is relatively big so there is a lot to explore, with some fun areas for shopping and dining, and some rougher areas in between. 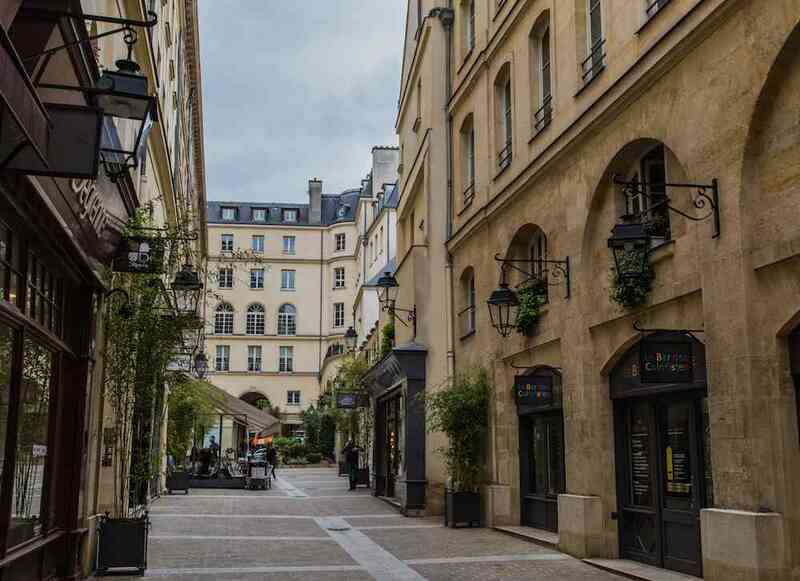 You’ll also come across a lot of shopping “passages” in the 9th & 2nd arrondissements (they are neighboring ‘hoods, despite the numbers), cool pedestrian shopping areas under arched roofs between major streets. Musée de la Vie Romantique – A residence from the era of the “romantics”, this former artist’s home has a courtyard and two artist workshops, and shows visitors what life was like in 1800s Paris. It still exhibits paintings from the original owner, Dutch artist Ary Scheffer. Galerie Vivienne – One of the grandest, most luxurious shopping passages, with a beautiful tiled floor. Passage des Panoramas – Built in 1799, the first covered passage of Paris. Home to restaurants, cafes, stores with old collections (coins, stamps, etc. ), and craftsmen’s stores. 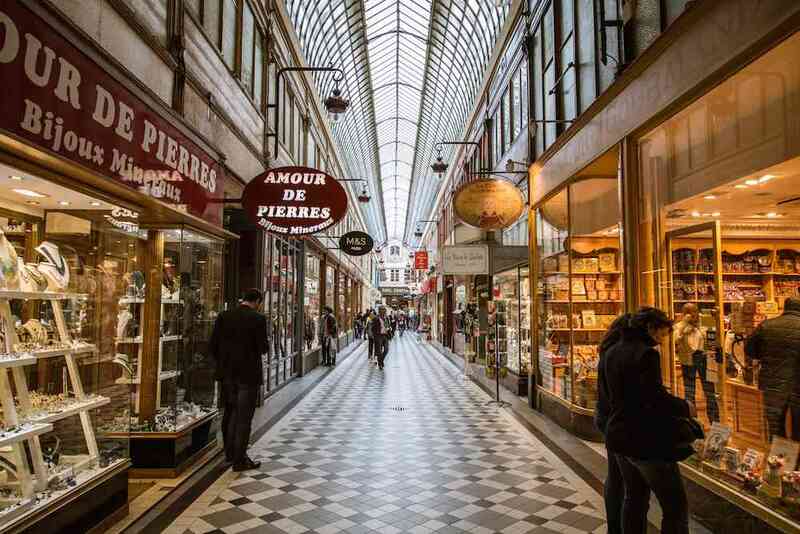 Passage Verdeau – Antique and coin shops abound throughout this passage. 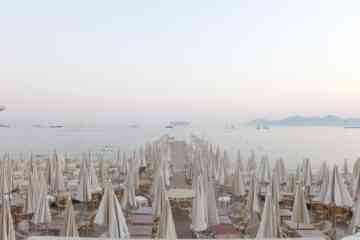 Verdeau, Jouffroy, and Panoramas are all continuations of each other, so you can see them all easily in one stroll. 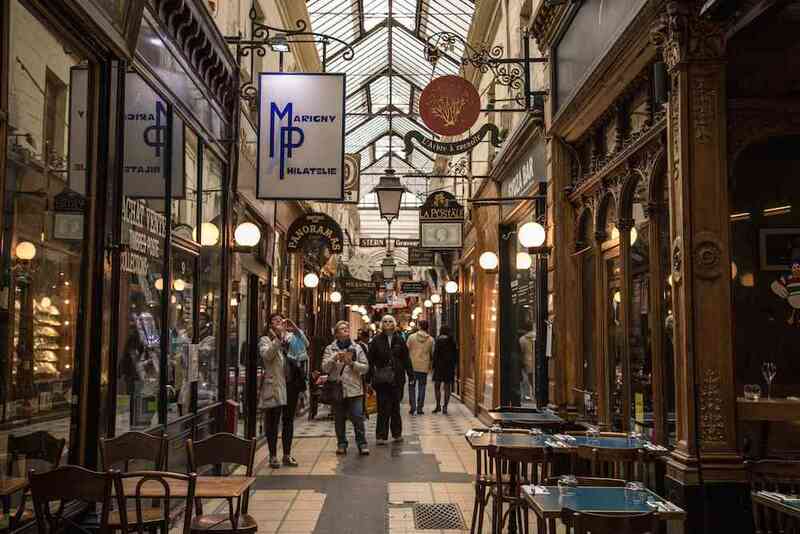 Passage Jouffroy – This passage also includes the affordable, small yet chic Hotel Chopin. 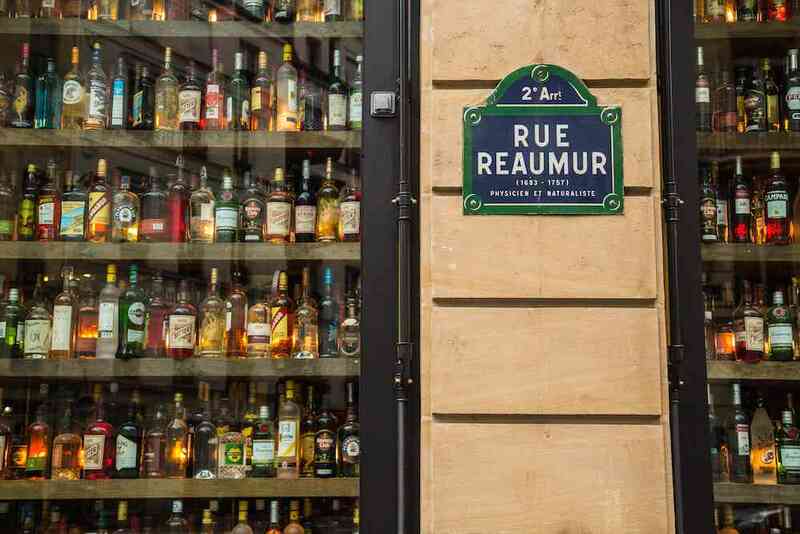 Located in the elegant 2nd Arrondissement, Rue Montorgueil is much more fun and relaxed than most other parts of this upscale area. 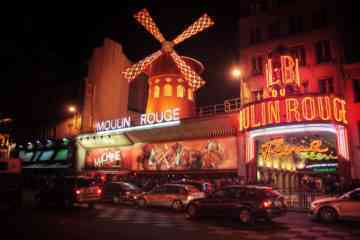 It is a bustling pedestrian street with restaurants, cafes, and eclair shops lining the main road. Local Tip: I got an eclair from L’Eclair de Genie, and it was one of the most delicious things I’ve eaten – this coming from a person who is not really into desserts. Check it out. 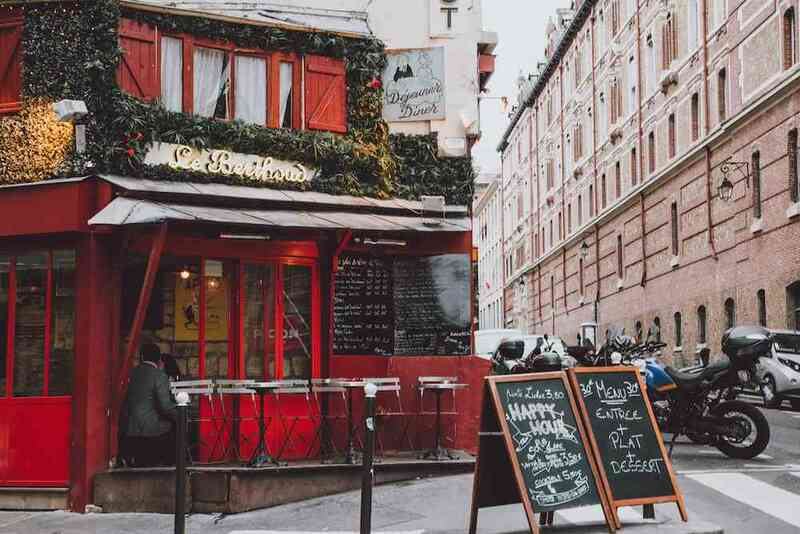 With the exception of the café above and a few others, you know what I love about many Parisian cafés? They set up all their seats facing outwards. It’s like they want you to just sit down, order a cappuccino, and watch the world go by. So why not do so? Paris is meant to be taken in slowly. Local Tip: Try ordering in French. 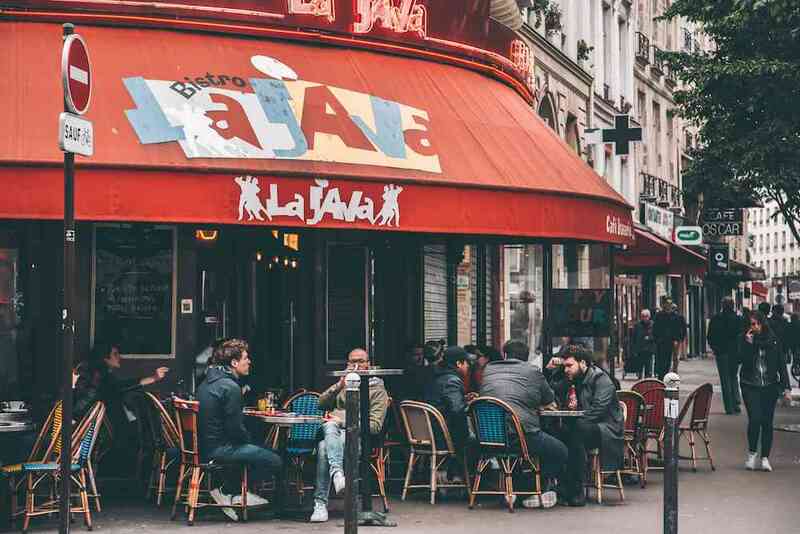 Actually, try picking up a few general phrases you might need in French before visiting Paris because locals do appreciate it. Here’s a French phrase guide! Oberkampf is a young, up-and-coming, alternative kind of neighborhood, with plenty of cool restaurants and bars. It helps to know some French to get around here, though it’s not necessary, and as with any up and coming hipster nightlife area, it has its grungy parts. 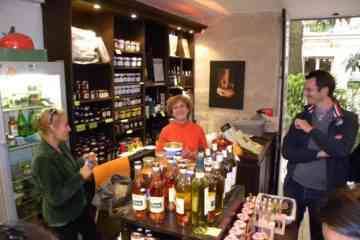 Cafe Charbon – An Oberkampf highlight. DJs play pop and electro beats and cool kids from all over Paris come here; according to locals, it gets insanely packed on weekend nights (open until 4 AM). Bonus: you can also get dinner here. Cantada II – A gothic-looking rock bar with live performances in the basement, and a huge selection of absinthes at the bar. 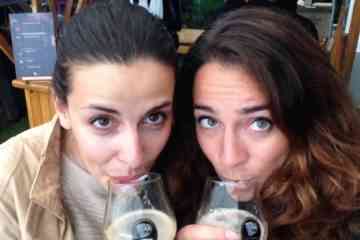 La Fine Mousse – A bar for those of you (and me) who love craft beer. The above suggestions are a starting point. But honestly, just start walking and see where the road takes you! 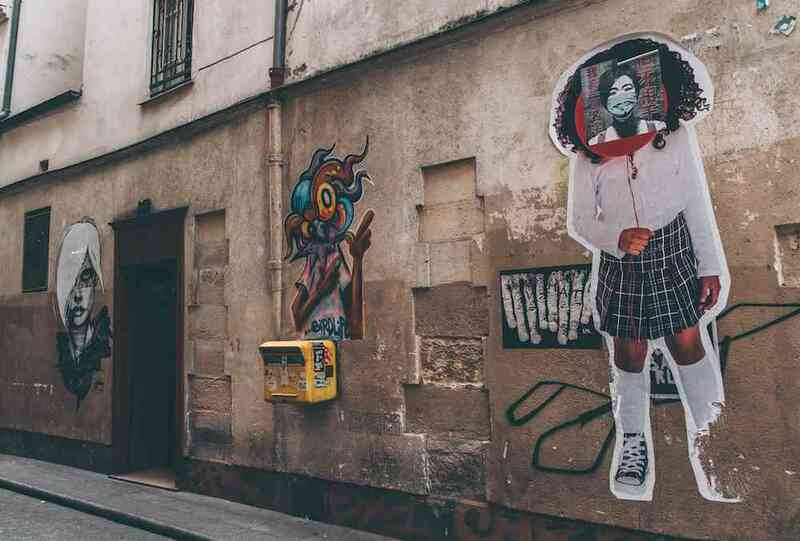 Paris has so many beautiful little streets and corners, but also edgy neighborhoods full of life, young energy, and of course, plenty of street art. Instead of sticking to the major boulevards, follow the small passages, narrow alleys, sloping streets, and you never know what you’ll discover or where you’ll end up. 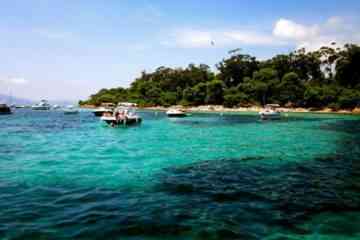 Of course, always follow your instincts and stay alert – if some place looks sketchy or has very little traffic, perhaps it’s best to avoid it unless you’re with a local who OKs the area. Paris is, above all, one of my favorite areas for people watching, street scenes, and street photography. If you go outside the major centers, the city is much less about elegance and glamor, and much more edgy, diverse, and energetic. 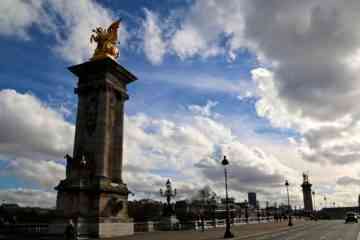 Want to Visit Paris Yourself? If you want to explore Paris next year, book Contiki Travels in Europe now and save 10%! First time in Paris? 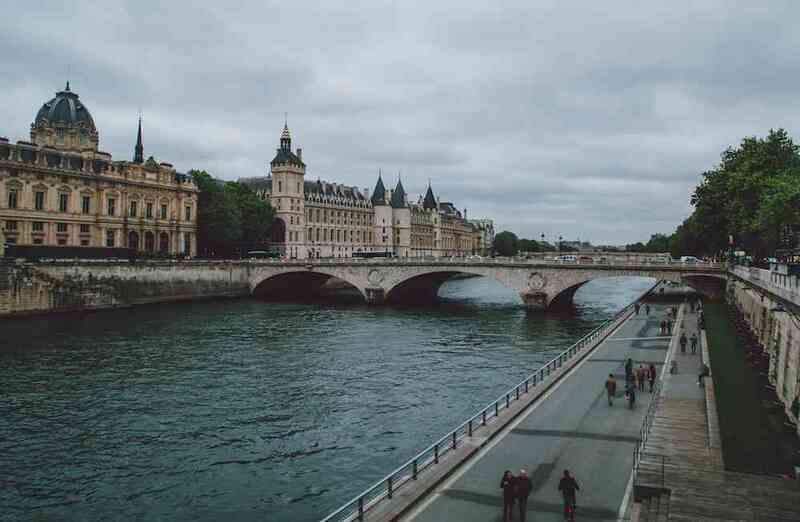 Check out my post on which Paris attractions you should visit! 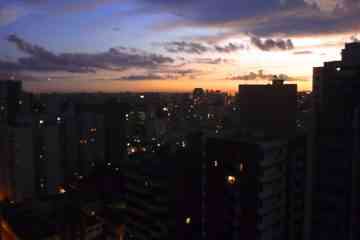 Is there a city you enjoyed more the second time around? Comment below, then share and pin away! To follow more of my travels and photos, stay up to date on Lose the Map Instagram! Paris was such a dream city of mine! I’ve not been there yet but I hope the time is coming so I could use your tips! Haha! 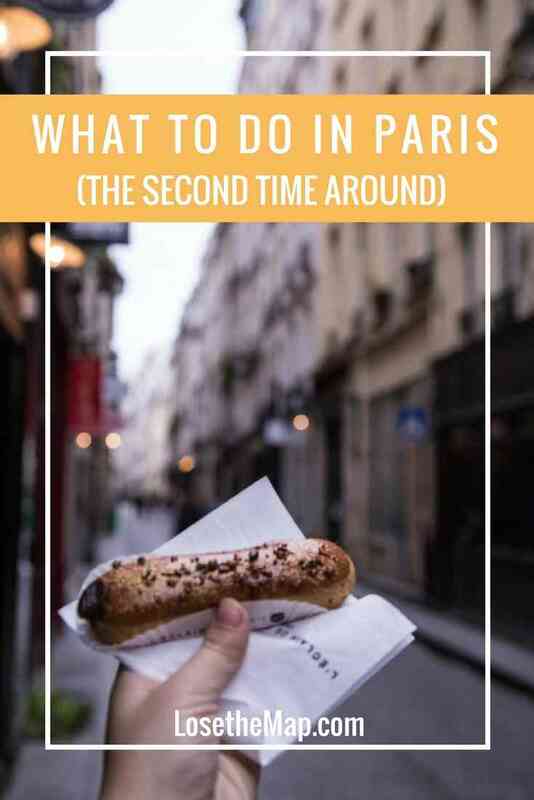 I went to Paris a few years ago and hated it, but been thinking recently that I should give it a second chance, so this post is perfect! Thanks for sharing. Haha it’s definitely much different after you go through the tourist stuff and get to cooler parts of the city! Thanks for this detailed guide! I love that word too – flaner – which perfectly describes one of my favorite city activities :) I’m in the mood to go back to Paris now! Aah I love Paris. I also went multiple times but can’t remember them all because I was little. 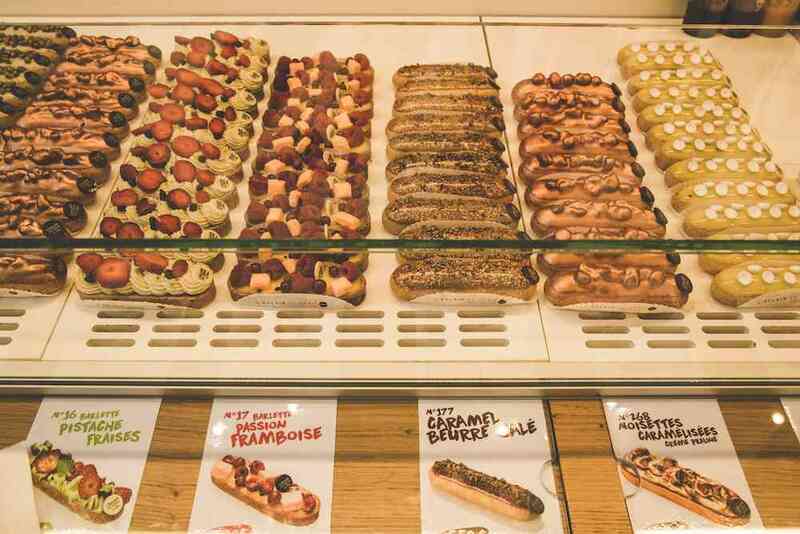 Next time I go I want an eclair from L’Eclair de Genie as well, they look too delicious.